Remember this post on organizing jewelry? I'm guessing no, but I want to update it a little. We've moved from an apartment to our first home in the last year and I've found a better way to store my earrings and jewelry and thought I would share. The rest of my jewelry now goes in a standing mirror jewelry armoire. You can see a teeny bit of it in the picture below. 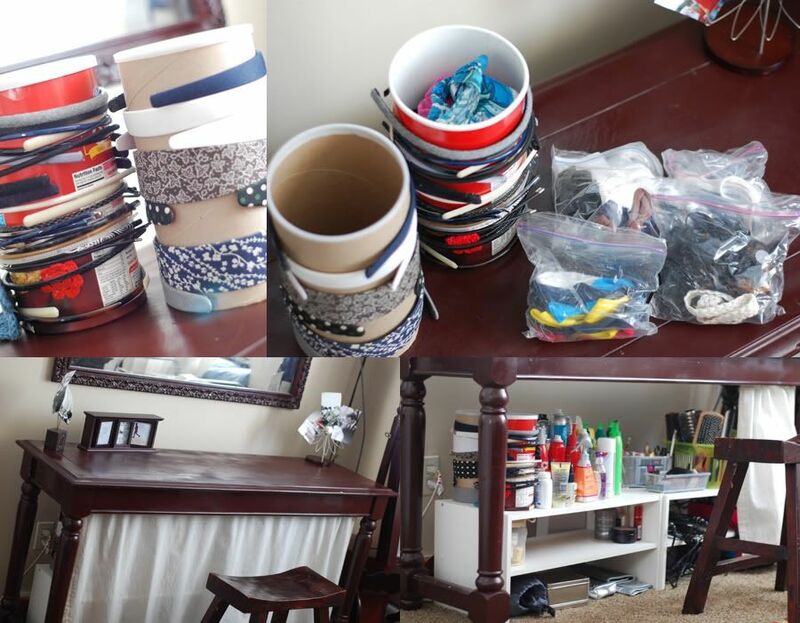 The upper two pictures are mainly what I wanted to show you- just two old oatmeal containers store all my headbands (I have a lot I know). What a great way to store headbands etc. though, right?! You could make them a lot more visually appealing by modge-podging some pretty paper on them I'm sure, but I just never seem to get around to it. I'm not that motivated because nobody ever sees them really but me. The lower two pictures I thought I would show you because that is where I store all my getting ready stuff and I get ready there each morning. We only have one bathroom in this little home of ours for now, so it comes in pretty handy. It's just a sofa table (hand-me-down) we painted, then put shoe storage shelves (garage sale find) underneath it for storage. I used fabric from curtains I got at a garage sale (10 for $10!!) and tailor-made them to cover up my stuff down there. I made side panels for the bottom too, but put them on after I took this picture. Oh, and the mirror above it? I got it for $1 at a yard sale and painted it to match too:) I love me some good deals!! I hesitate to post house pics, because my house is never how I want it really, but I've decided recently to be proud of what I have done and be okay that it is all a works in progress. So expect to see more house pics and let me know what you think. 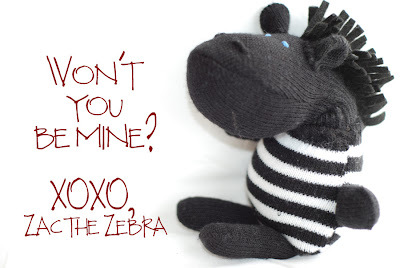 This was my first attempt at a glove-stuffed animal. I made a couple of mistakes but all in all I thought he turned out pretty cute! I got the gloves on clearance for $2 and everything else I had around the house. I sewed his eyes with embroidery thread and I made his mane out of scrap felt. I realized in posting these pics that he still needs a tail. I think I will braid him a tail out of yarn and sew it on. I also think he needs a little heart sewn on to his chest. 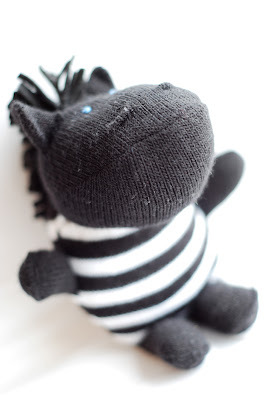 Then I can give him to my 18 month old and see if he likes him enough to make more to add to my little glove-aminal family!